Implantation of the fertilized ovum occurs on the seventh to tenth day following conception. The layer of cells forming the surface of the blastocyst develops into the chorionic membrane, and cytotrophoblast cells proliferate from it. Trophoblast cells already are visible and functioning in the invasive process of implantation (Fig. 1). Syncytiotrophoblast cells are multinucleated aggregates of cytotrophoblast cells and are formed continually from them. 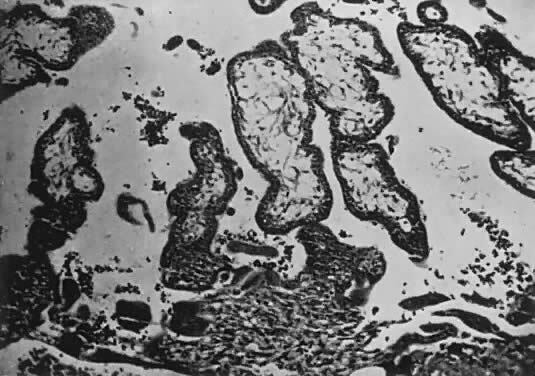 These cells, plus the villi, are the characteristic and unique features of the human placenta. 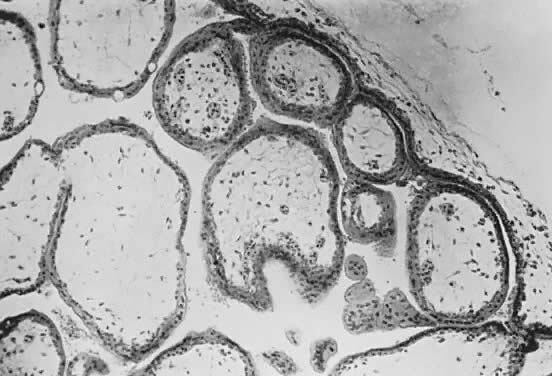 Venous sinuses within the endometrium are invaded very early by trophoblast cells. Lacunae surrounded by syncytial cells and filled with maternal venous blood and tissue fluid develop within a few days. Villi first become recognizable on the 12th day of development, when the solid layer of invading trophoblast is penetrated by a mesenchymal core, presumably derived from cytotrophoblast, to form secondary villi. Maternal spiral arterioles are eroded on the 14th or 15th day, and maternal arterial blood enters the developing intervillous space. Fetal vessels are formed in situ within the mesenchymal cores, and the resulting villi are called tertiary villi. By approximately the 17th day following conception, both fetal and maternal blood vessels are functioning, and true placental circulation is established. Meanwhile, the endometrium, under the influence of estrogen and progesterone, has undergone striking changes in preparation for implantation. Stromal cells have become enlarged and pale staining and are surrounded by edema fluid; gland cells are filled with glycogen. This endometrium, called decidua because it sheds at the end of the pregnancy, is arranged into three layers: a compact surface layer with few glands, a spongy middle layer with many glands and vessels, and a basal layer. The blastocyst invades to and develops within the spongy layer. The decidua covering the blastocyst 2 to 3 days after implantation is called the decidua capsularis. The decidua of the remainder of the cavity of the uterus is called the decidua parietalis. When the enlarging embryo finally completely fills the endometrial cavity during the third or fourth month of pregnancy, the decidua capsularis fuses with the decidua parietalis opposite it and obliterates the endometrial cavity. Villi are distributed over the entire chorionic membrane, giving the ovum a grossly shaggy appearance (Fig. 2). The villi in contact with the decidua basalis proliferate to form the chorion frondosum, which is the fetal component of the placenta, whereas those in relation to the decidua capsularis cease to grow; the latter undergo almost complete degeneration by the end of the fourth month of pregnancy and form the chorion laeve. Occasionally, remnants of villi can be seen clinging to its surface with a few shreds of decidua. 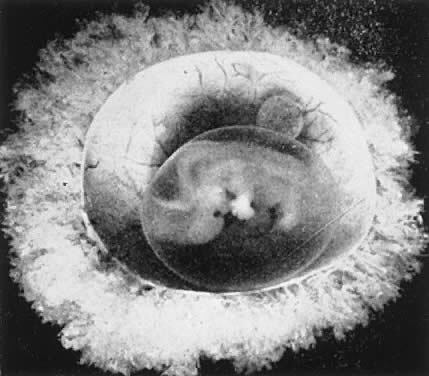 The developing embryo is oriented so that its ectodermal or dorsal surface is in contact with the decidua basalis, and it is on this surface that the amniotic cavity first begins to appear. The amniotic cavity probably is formed by a split in the chorion just over the developing ectoderm and neural ridge. It fills with fluid and rapidly expands to surround the entire embryo, obliterating the space between it and the chorion by the end of the third month. On the ventral surface of the embryo, a yolk sac and an allantoic sac are formed, each with vessels and ducts connected to the future caudal end of the embryo through the body stalk. The vessels to the allantoic sac become the umbilical vessels and join with newly formed vessels in the mesenchyme of the inner surface of the chorion to form the fetal portion of the vessels to the placenta. The body stalk becomes the umbilical cord and is covered with amnion. The yolk sac never completely develops; after providing endoderm to form the primitive gut and the primordial germ cells which migrate to the mesonephric folds (i.e. genital ridges) to develop into the gonads, it atrophies relatively quickly. It occasionally can be found as a small vesicle within the fetal surface of the placenta next to the insertion of the cord. Fetal and maternal vascularization of the placenta is complete by the 17th to 20th day, and nucleated fetal red blood cells can be found within the fetal vessels after the 21st day following conception (Fig. 3). The placenta continues to grow in thickness and circumference until the end of the fourth month. Increased thickness of the placenta is the result of growth in the length and size of the villi of the chorion frondosum, with accompanying expansion of the intervillous space. After the fourth month there is no appreciable increase in thickness, but growth in circumference continues through most of pregnancy. Further fetal development is discussed elsewhere in this text. The human placenta is a hemochorial placenta, which means that maternal blood is in direct contact with fetal trophoblast. The syncytiotrophoblast invades maternal venous sinuses relatively early and invades the spiral arterioles on the 17th or 18th day after conception. The lacunae, or lakes formed by maternal tissue fluid and blood, form the intervillous space; throughout the rest of pregnancy maternal blood circulates freely within the intervillous space. 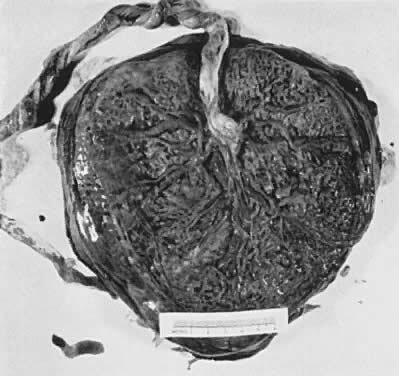 The placenta is divided into cotyledons, each supplied by a major branch of the umbilical artery and drained by a major tributary to the umbilical vein (Fig. 4). These vessels enter stem villi, which branch and rebranch like a tree to form microscopic terminal villi suspended within the intervillous space. Each cotyledon has several anchoring villi which extend into the decidua basalis and are anchored to it by syncytial cells and fibrin. Fig. 4. 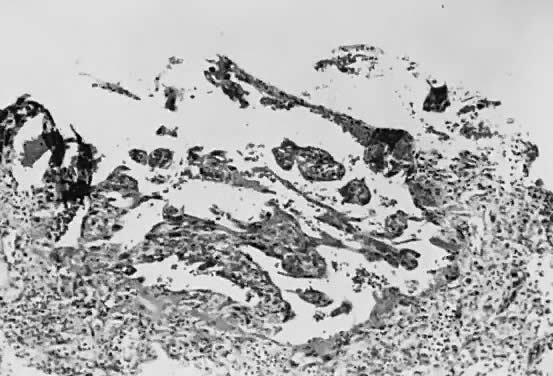 Maternal surface of term human placenta. Note division into cotyledons. When viewed from the fetal surface, the placenta is a flat, smooth disk with the umbilical cord entering perpendicularly near its center. Fetal vessels radiate from the umbilical cord between the amnion and chorion like the spokes of a wheel (Fig. 5). The membranes on the surface of the placenta are continuous at its margin with the chorion and amnion lining the remainder of the uterine cavity. Fig. 5. 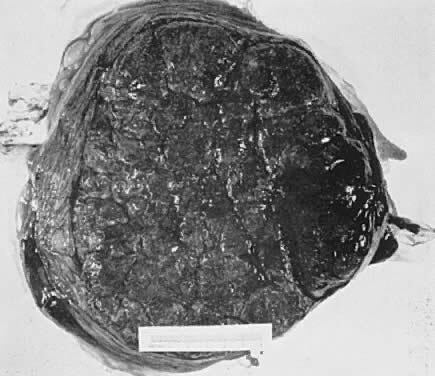 Fetal surface of term human placenta. Fetal vessels radiate from the cord insertion. The maternal surface of the placenta usually appears to have several major divisions. Each of these contains several fetal cotyledons (see Fig. 4). The grooves or depressions in the maternal surface of the placenta are formed by decidual septa that help anchor the placenta and limit the lateral flow of blood within the intervillous space. Between these septa, several spiral arterioles empty directly into the intervillous space. Each spiral arteriole has several venous sinuses associated with it to provide venous return to the maternal circulation. There are no maternal end-arterioles or end-capillaries (Fig. 6). Maternal blood enters the intervillous space in jets or spurts from the spiral arterioles and continues under the force of maternal blood pressure to the chorionic plate. The blood then is deflected laterally, forming the shape of a doughnut with each spurt, and flows back toward the decidua basalis, bathing the small villi as it does so; it is then drained off by maternal venous sinuses. Older theories held that all the arterial input to the placenta was carried laterally to a large marginal sinus which drained into maternal veins. Although there may be relatively more blood at the margin of the placenta, there apparently is no true marginal sinus. Blood entering through spiral arterioles near the center of the placenta does not have to traverse half the placenta to find maternal veins. This organization of the placenta continues throughout pregnancy. Villi continue to proliferate and develop until term. As term approaches, there may be degeneration of some villi, piling up of fibrinlike material between the villi, and, sometimes, heaping up of syncytial cells to form syncytial knots. However, the functional portion of the placenta continues to proliferate and grow as pregnancy progresses. The trophoblast has two layers: the cytotrophoblast and the syncytiotrophoblast. Syncytiotrophoblast is formed from the underlying cytotrophoblast. In the first part of pregnancy, these two layers usually are quite distinct on microscopic examination and can be used to date a placenta or pregnancy. Fetal vessels with nucleated fetal red blood cells appear at 21 days' gestation. Thus, the presence of both trophoblast cell layers in the absence of vessels indicates a pregnancy of <21 days. Fetal vessels and red blood cells, along with two cell layers of trophoblast, indicate a pregnancy of 21 days to 5 months (see Fig. 3). After the fifth month of pregnancy, the cytotrophoblast, when viewed under a light microscope, appears to degenerate. Electron microscopic studies have revealed that although the cytotrophoblast becomes thinner, it remains throughout pregnancy, and all syncytial cells formed during the latter half of pregnancy are formed from cytotrophoblast, as in the first portion of gestation. The apparent absence of cytotrophoblast signifies a pregnancy beyond 5 months (Fig. 7). Toward term, the mesenchymal core of each villus becomes more dense and compact, and the fetal vessels appear to be much closer to the overlying syncytiotrophoblast, possibly facilitating transfer of nutrients or waste products. These changes, combined with fibrin deposition within the intervillous space and occasional syncytial knots, are characteristic of a term placenta. At term, the human placenta weighs approximately 500 g.
The amnion forms from splitting of the cytotrophoblast. Its inner layer becomes epithelial, and mesenchymal cells develop on its outer surface. By the end of the third month of pregnancy, the amnion has expanded to obliterate the yolk sac, the allantoic sac, and the extracoelomic space within the chorion. It fuses with the mesenchyme on the inner surface of the chorion. The two membranes appear as one, although they usually are easily separable at any time thereafter (Fig. 8). The endometrial cavity has been obliterated by the fourth month of pregnancy, allowing the fused membranes to be in contact with the decidua parietalis throughout the uterus. Amniotic fluid volume at term is approximately 1000 ml, with a turnover rate of 500 ml/hour. The fetus floats freely within the amniotic sac connected to the placenta and the mother by the umbilical cord, which contains two arteries and one vein. The right umbilical vein disappears relatively early in the human, leaving only the single left vein. There have been descriptions of nerve fibers within the umbilical cord, perhaps explaining some of the reflex responses to cord stimulation. However, none has been found within the placenta. There is no demonstrable direct neural contact between mother and infant. The function of the human placenta is of interest from both a scientific and a clinical point of view. Unfortunately, in vivo study of the human placenta is very difficult because the methodology carries with it unacceptable risks to both mother and fetus. Therefore, most of our knowledge about the function of the placenta has been derived from animal models. The placentas of higher primates are morphologically most comparable to that of humans. Suitable primates, however, are small, with even smaller fetuses. They have little tolerance for indwelling catheters and often abort or deliver prematurely after intrauterine surgery. In addition, these animals are prohibitively expensive and thus have not been used extensively. Placental exchange has most thoroughly been studied in the rabbit, guinea pig, and rat. The ultrastructure of their placental barriers is comparable to that of the human (i.e. hemochorial placenta). The most widely used of all laboratory animals in this regard, however, is the sheep. Pregnant ewes are of comparable size to humans, with equally large fetuses that tolerate intrauterine surgery well. The exchange barrier (i.e. epitheliochorial placenta) is quite unlike that of the human, however. There is no good evidence that the placenta hemodynamics of the sheep are comparable to those in humans; however, there is also little evidence to the contrary. Placentas have three functions: the exchange of nutrient and waste materials between mother and fetus, the manufacture and secretion of hormones, and the maintenance of an immunologic barrier. Only the exchange function and the hormone function of the placental barrier are discussed in detail in this chapter. Because the exchange function is so dependent on the rates of maternal and fetal placental blood flows, we must first discuss placental hemodynamics. The placenta is the only organ in the body with two separate blood supplies, each coming from a separate organism. We have already discussed the morphologic organization and ultrastructure of these two circulations. Because the placenta is a transient organ and the blood flows change rapidly with each stage of pregnancy, we know less about the regulation of these blood flows than we do about the regulation of the blood flow to any other organ in the body. The uteroplacental circulation is a low-resistance system for the maternal organism. Resistance to blood flow is defined as the ratio of the driving pressure and flow, where the driving pressure is the difference between the central arterial pressure and the venous outflow pressure. There is some question regarding the validity of using central arterial pressure in the calculation of the driving pressure, however, because direct measurement of mean pressures in the preplacental arteries of animals with hemochorial placentas have been found to be approximately 8% to 20% of the mean central arterial pressures. These findings indicate that the physiologic regulation of maternal placental blood flow may be complex and may depend on an arterial resistance to flow at a site outside the organ itself. As a low-resistance system, the uteroplacental circulation is responsible for, or at least contributes to, marked changes in maternal cardiovascular physiology. Uterine arterial blood flow in the nonpregnant state averages 1% to 2% of the maternal cardiac output. During pregnancy, uterine blood flow rises markedly until at term it accounts for as much as 17% of the maternal cardiac output (Table 1; Fig. 9). Some representative measurements of uteroplacental blood flow are listed in Table 2. Maternal cardiac output per se increases 35% to 40% during pregnancy.15 Heart rate also increases but does so disproportionately with cardiac output, resulting in a significant increase in stroke volume. There is a slight fall in mean arterial pressure resulting from a significant decrease in systemic vascular resistance; this reflects not only the development of the low-resistance uteroplacental vascular bed but also generalized systemic vasodilation. This explains the necessity of the 30% to 40% expansion in blood volume associated with normal pregnancy to maintain blood flow to other organs. Other maternal physiologic adaptations to pregnancy are described elsewhere in this text. * Figures represent mean ± 1 SE of several readings taken in the control period after surgery has been completed. † Expressed as per kilogram of ewe's weight. The fetal placental circulation receives approximately two thirds of the total fetal cardiac output. Some representative measurements of umbilical blood flow are listed in Table 2. This high flow rate is important in the transport of oxygen and nutrients from mother to fetus and is maintained by a number of anatomic differences in the fetal circulation. Because the fetal lungs do not have any respiratory function, a high vascular resistance is maintained in this organ by the mechanical effects of the unexpanded alveoli on the vessel walls and the vasoconstrictive effect of the low oxygen tension that prevails in the fetal blood. These two factors combine to shunt approximately two thirds of the right ventricular output away from the lungs toward the systemic circulation through the ductus arteriosus, which is maintained patent by the same low oxygen tension that keeps the pulmonary vessels constricted. With the large right-to-left shunt, a high cardiac output (almost twice that of the mother) is created, providing for a high flow rate across the placental exchange membranes. The controversy over the existence of shunts in the maternal and fetal placental circulations stems, at least in part, from the inconstant use of the word shunt.16 If a maternal shunt is defined as that fraction of the uterine blood flow that does not supply an area where exchange between maternal blood and fetal blood takes place, about 84% of the uterine blood flow during the last third of gestation is placental blood flow in most animals. However, the actual maternal shunt may be greater than the nonplacental blood flow if there are additional shunts in the placental or preplacental vessels. A fetal shunt may be defined as the fraction of the umbilical blood flow that does not supply an area where exchange between fetal blood and maternal blood takes place. In sheep, it has been demonstrated that during the last third of gestation about 6% of the umbilical flow was not placental flow but that which perfused the intercotyledonary chorion. We cannot assume, however, that this value applies to other species, including primates, because of morphologic differences. As is true with the uterine circulation, the actual shunt in the umbilical circulation may be even greater if there are also shunts within the placenta. One must consider first whether the pressure in the surrounding tissue and the adjacent circulation plays a role in the regulation of either the maternal or the fetal placental blood flow. During labor, uterine contractions grossly impair maternal placental blood flow, presumably by distortion or occlusion of the preplacental vessels.2 Whether or not mechanical factors play a role in flow regulation before labor, however, is open to question. If anywhere along a vessel there is an external “surrounding pressure” that is greater than the intravascular pressure, the vessel will collapse at that site. Driving pressure under these conditions is the difference between arterial pressure and the surrounding pressure. Flow under these circumstances is called sluice flow.16 With this type of flow, increased uterine vein pressure could result in impedance of the umbilical circulation. Sluice flow has been observed in the umbilical circulation only in artificially perfused placental preparations. Intact, unanesthetized fetal lambs have yielded no evidence that umbilical vascular resistance was affected by changes in uterine venous pressure. In species with hemochorial villous placentas in which the maternal blood flows in the intervillous space surrounding the fetal villi, sluice flow appears to be anatomically possible, but as yet there is no physiologic evidence for it. An important question is whether the uteroplacental circulation is able to autoregulate. Autoregulation is generally defined as the ability of an organ to adjust its vascular resistance by local control mechanisms in the face of changing perfusion pressure.17 Thus, the effects of changes in perfusion pressure are minimized, and blood flow remains constant. From the standpoint of the fetus, autoregulation in the uteroplacental circulation would seem to be essential. Studies in pregnant sheep, however, indicate that uterine blood flow varies directly proportionally with mean arterial pressure and have failed to demonstrate a system of autoregulation. The presence of autoregulation mechanisms has been suggested by the maintenance of a constant flow rate over a wide range of pressures in pregnant rabbits and pregnant rhesus monkeys, but the evidence is not conclusive. Maternal regulation of uterine and placental blood flows does not appear to be strong.18 The degree of autonomic innervation to the uterine vasculature during pregnancy varies widely from species to species. Both adrenergic and cholinergic sympathetic fibers are found in the uteri of most animals. Sacral nervous influences may be involved in the maintenance of a high uterine blood flow rate in those species that possess cholinergic innervation (e.g. uterine nerve stimulation in the pregnant guinea pig causes uterine vasodilation). Adrenergic fibers are present in the uterus of all animals studied, but histologic examination reveals that pregnancy causes the complete disappearance of these fibers in the myometrium and a great reduction in their numbers around the uterine blood vessels. Nevertheless, electrical stimulation of the sympathetic chain in term pregnant sheep and dogs results in increased uterine vascular resistance and decreased uterine blood flow. There are a number of chemical factors that are vasoactive in the uteroplacental circulation. The results of older studies in anesthetized pregnant sheep seemed to indicate that hypoxia could increase as well as decrease uterine blood flow, but experiments with conscious animals have failed to show any appreciable effect of maternal hypoxia or hyperoxia on uteroplacental blood flow. The uterine vasculature is also relatively insensitive to hypercapnia and hypocapnia, although hypocapnia has been reported to cause a reduction in placental, but not myometrial, blood flow in rabbits. The results of these studies may have been influenced by secondary factors such as catecholamine release, however. Thus, the available evidence strongly suggests that changes in maternal arterial blood gases are not of physiologic importance for short-term regulation of uteroplacental blood flow. Intravenous infusion of exogenous epinephrine and norepinephrine causes a strong dose-dependent decrease in uterine blood flow in both nonpregnant and pregnant sheep; in the latter, the response was observed in both the myometrial and the maternal placental blood flows. This seems to demonstrate the existence of an adrenergic vasoconstrictor mechanism in the uterine and maternal placental circulations. The vasoconstriction response of the maternal placental vascular bed to α-adrenergic receptor stimulation is, by far, the most definite and unambiguous response of the placenta to any maternal vasoactive agent. The response to β-adrenergic stimulation is not so clear-cut. Although the vasculature of the nonpregnant uterus responds to β-adrenergic agonists with vasodilation, there is no evidence for β-adrenergic activity at all during pregnancy, and specific β-adrenergic receptor blockade does not alter uterine blood flow. The real role of angiotensin II in the maintenance of the uteroplacental circulation is also unclear. Angiotensin II is a powerful vasoconstrictor, yet in various animals the response to angiotensin II infusion varies from an increase in vascular resistance to a decrease in vascular resistance in the maternal placental circulation. These conflicting reports probably reflect differences in dosage and the physiologic state of the animal preparation. The estrogens, particularly 17β-estradiol, have been found to cause vasodilation of the nonpregnant uterine vasculature, with blood flows increasing as much as tenfold. This response is delayed, however, and the peak response is not attained until about 1.5 hours after the stimulus. Similar but smaller responses have been observed during pregnancy, suggesting that the maintenance of a high rate of maternal placental blood flow may be, in part, due to the endocrine function (estrogen production) of the placenta. The actions of the prostaglandins in the maternal placental circulation are also unclear.17 Metabolites of arachidonic acid (eicosanoids), produced by both the cyclooxygenase and lipoxygenase pathways, are synthesized during pregnancy and are implicated in the regulation of systemic and local blood flows in both maternal and fetal vascular systems.18 The actions of these substances on the placental circulation vary not only by their concentrations, interactions with other vasoactive agents, and animal species studied but also by the ability of some prostaglandins to induce uterine contractions, thus occluding the input and output vessels. Cyclooxygenase converts arachidonic acid to prostaglandin G2 (PGG2), which is rapidly converted to prostaglandin H2 (PGH2). These short-lived intermediates possess intrinsic biologic activity which can be inhibited by nonsteroidal anti-inflammatory agents (NSAIDs).19 PGH2 is subsequently converted into thromboxane and prostaglandins F2α, D2, and E2. Thromboxane serves as a potent vasoconstrictor, stimulator of platelet aggregation, and stimulator of uterine contractility.20 PGF2α has vasoconstrictive properties, whereas PGD2 has vasodilating effects. PGE2 is also a vasodilator, but it causes uterine contractions and decreased placental blood flow when administered to pregnant sheep. When administered to the fetus, however, thus bypassing the myometrium, PGE2 causes vasodilation of the maternal placental circulation. Prostacyclin (PGI2), also derived from PGH2, is a vasodilator produced by the pregnant uterus that does not cause uterine contractions in the near-term sheep. PGI2 infusion results in a slight maternal placental vasoconstriction, but this response may be secondary to the maternal hypotension and release of circulating catecholamines. Blockage of prostaglandin synthesis with indomethacin in near-term pregnant sheep and rabbits causes vasoconstriction of the placental circulation but not of the myometrium. These experiments suggest that the placenta synthesizes dilating prostaglandins, probably PGE2 or PGI2. The maternal placental blood flow does not appear to be under strong maternal control.21 The mother seems to be able to shut down the placental circulation by α-adrenergic receptor stimulation, but there is little response to other circulating vasoactive agents. Teleologically, the mother's only control is in the ability to sacrifice the fetus under certain circumstances. Regulation of the fetal placental circulation is also poorly understood.17 The evidence for autonomic innervation of the umbilical circulation is conflicting. Whereas histochemical methods have been unable to demonstrate either adrenergic or cholinergic fibers in the human placenta and umbilical cord, methylene-blue-staining fibers have been found in the umbilical arteries and the placenta of lower primates. Both adrenergic and cholinergic fibers are evident in the intrafetal umbilical vessels in the guinea pig. As with the maternal placental circulation, most of our understanding about the chemical control of the umbilical circulation comes from studies in pregnant sheep. Blockade of α-adrenergic or angiotensin receptors has no effect on the resistance of the umbilical vascular bed, and this is taken to imply that the maintenance of normal tone in this vascular bed is not under the control of angiotensin or circulating catecholamines. Exogenously administered angiotensin and catecholamines both produce umbilical vasoconstriction, but their role in the normal physiologic state is still questionable. Estrogens have been shown to dilate the umbilical artery, and in most species, estrogen levels tend to increase near parturition, but it is not clear whether they play a role in regulation of the umbilical circulation. The influence of prostaglandins on the umbilical circulation is quite different from that on the maternal placental circulation. The umbilical vascular bed is unresponsive to exogenous PGI2, but PGE2 produces a greater degree of vasoconstriction than the maximal response to angiotensin, norepinephrine, or any other chemical substance. However, indomethacin causes vasoconstriction in the fetal placental circulation, which argues against the existence of an endogenous prostaglandin vasoconstriction mechanism. There is no compelling evidence that any of these agents are involved in the regulation of the umbilical blood flow. Before leaving the discussion of uteroplacental blood flow regulation, one other possibility must be considered. If maternal placental blood flow is not controlled by the mother, could it be under fetal control?17 Recently, it has been demonstrated that the perfusion-perfusion ratios in the sheep placenta are extremely evenly distributed at the macroscopic level. Such a similarity in blood flows and their distributions argues for the presence of a regulating mechanism. In such a system, a reduction of maternal flow would be accompanied by the synthesis of a fetal vasoconstrictor and maternal vasodilator, thereby maintaining the perfusion-perfusion ratio. PGE2 has been shown to cause vasodilation in the maternal placental vascular bed when given by way of the fetal circulation, and it also has a vasoconstricting effect on the umbilical circulation. Some evidence also suggests that fetal vessels synthesize PGE2. The existence of such a chemical link between mother and fetus is suggested by experiments in both sheep and rabbits in which occlusion of the umbilical blood flow causes a fall in uterine blood flow. The evidence for fetal control of the maternal placental circulation is by no means conclusive, but the lack of evidence for strong maternal control makes it an attractive possibility. Throughout pregnancy, the placenta retains the primary role of all biologic membranes (i.e. selective permeability).16,22,23 With particulate matter such as blood cells and macromolecules, transfer is severely restricted, providing a “placental barrier.” At the other end of the spectrum, the transfer of many essential nutrients is accelerated by a variety of transport mechanisms. The ideal blood flow in a transport system such as that represented by the placenta is a countercurrent flow, in which the two bloodstreams flow in directions exactly opposite to each other (Fig. 10). With this flow, the widest possible gradient for exchange between the two bloodstreams exists over the entire length of the exchange membrane. This is important in the exchange of materials that cross the placenta by simple diffusion, because the only driving force is the concentration gradient. Concurrent flow, in which the two bloodstreams flow in the same direction (i.e. parallel to each other), is the least efficient for transfer. In the human placenta, a compromise probably exists in that maternal blood flows randomly in all directions with respect to the fetal circulation. This is known as crosscurrent flow, or pool flow. The villi are bathed continually by a fountain of maternal blood with completely variable combinations of flow directions (see Fig. 6). Some transport efficiency is obviously lost by this distribution. There are several factors that influence O2 transfer across the placenta. The fetus compensates for low O2 levels with a higher blood concentration of hemoglobin (see Table 3), which has a greater affinity for O2. The fetal hemoglobin O2 dissociation curve is shifted to the left of that for maternal blood, which means that for any given O2 tension, fetal blood contains a greater amount of O2 than maternal blood. Furthermore, the release of fetal metabolites into the maternal blood results in a fall in the pH of maternal blood, which shifts the maternal O2 dissociation curve even further right, automatically increasing the mass transfer of O2 to the fetus (i.e. Bohr effect). There is some evidence that O2 may be transferred across the placenta by facilitated diffusion with cytochrome P-450 as the carrier; however, this has not been confirmed. It could be argued that the O2-diffusing capacity of the placenta computed from the known CO-diffusing capacity fully accounts for the observed transplacental fluxes of O2; thus, postulation of a carrier is unnecessary. Carbon dioxide transfer between mother and fetus has been studied less extensively. The diffusion constant of CO2 is 20 times higher than that for O2; therefore, membrane resistance is clearly not a factor. Most reports indicate that there is a narrow gradient across the placenta in favor of the fetus. Although CO2 is present in the blood in the form of dissolved gas (CO2), carbonic acid (H2CO3), bicarbonate ion (HCO3-), carbonate ion (CO2-), and carbaminohemoglobin, experimental evidence indicates that placental transfer of carbon dioxide is in the form of CO2 and that the transfer of the other forms is comparatively negligible. The fetus requires a continuous influx of fuels for combustion and of building materials for growth. In addition, the fetus requires vitamins, trace elements, and, perhaps, hormones as cofactors and regulators of the metabolic processes. In animals and humans, the concentration of glucose, the principal metabolic fuel, is higher in maternal than in fetal plasma (Table 4). It is also known that fetal glucose is derived from maternal plasma. These observations are compatible with a purely diffusional process for glucose transport. However, studies in animals have demonstrated that transport of D-glucose occurs much faster than that of molecules of comparable molecular weight such as mannitol or L-glucose. Furthermore, the transport of 3-0-methyl-D-glucopyranose (3MeG) is considerably greater than predicted by its molecular weight; its transfer is also inhibited by the presence of D-glucose. These observations strongly suggest the presence of a shared carrier mechanism for 3MeG and D-glucose. This process, known as facilitated diffusion, involves a membrane carrier that, when combined with glucose, increases the solubility of glucose in the lipid bilayer portion of the membrane, thus speeding its diffusion across the barrier. There is no evidence that energy is required (i.e. active transport), however. Fructose is present in the plasma of both mother and fetus in small quantities (see Table 4). It is not used as a fetal fuel or as a building material in significant amounts, except perhaps during periods of fetal hypoglycemia. The placental barrier is almost totally impermeable to fructose, and this sugar is apparently synthesized from D-glucose by the placenta. Lactate is also produced by the placenta from D-glucose, and there is apparently no transfer back to the mother. There is presumptive evidence for placental transfer of acetate, but the mechanism is unexplored. Although free fatty acids do not cross the placenta of sheep easily, they readily cross the hemochorial placentas of the rabbit, guinea pig, and rhesus monkey and participate in the synthesis of fetal lipids. This strongly suggests that they also cross the human placenta. The mechanism by which these substances cross the placenta is unexplored. Triglycerides are carried in the plasma in chylomicrons, which are too large to travel in the interstitial spaces of the placenta. They do not cross the placenta to any significant degree. Cholesterol is carried in the plasma, mostly in the esterified form as lipoprotein, and it is extremely unlikely that cholesterol can cross the placenta in this form. Maternal cholesterol does reach the fetus; however, the mechanism involved is unknown. Amino acids are delivered to the fetus mainly for protein synthesis, but they also contribute to the requirements for fetal energy. The fetal plasma concentration is higher than the maternal plasma concentration for all amino acids except citrulline (Table 5). The placental tissue also concentrates a large number of amino acids intracellularly from maternal plasma. The fetal uptake of amino acids may depend to some extent on this concentrating capacity of the placenta. Uptake of amino acids from the maternal plasma by the placenta occurs by diffusion and active transport involving a carrier.24 The transport carriers are stereospecific, transporting the L-amino acids more rapidly than the D-amino acids. Recent evidence also indicates that placental amino acid transport is dependent on a process requiring protein synthesis, suggesting that the carriers are integral membrane proteins, which must be synthesized. Additionally, the active transport of amino acids is mediated by several pathways that are specific for several groups of amino acids. Three separate placental transport systems have been described for the neutral amino acids (Table 6): the A, or alanine-preferring system; the L, or leucine-preferring system; and the ASC, or alanine-serine system. Each system preferentially transports certain neutral amino acids, but there is considerable overlap among the systems. The overlap may be of considerable importance in ensuring the fetus receives an adequate supply of amino acids in the face of decreased maternal concentrations. In addition, regulation of fetal amino acid uptake may be, in part, the result of changes in the relative activity of these separation transport systems. It is also likely that additional, unidentified transport pathways are present for the acidic and basic amino acids as well. The fat-soluble vitamins are transported in the plasma bound to proteins, sometimes in lipoprotein complexes. The mechanisms and ease of release to the placenta are unknown, and transfer is believed to be by simple diffusion. Levels of the fat-soluble vitamins in the fetal blood are lower than those in maternal blood. The water-soluble vitamins are found in the fetal blood at levels higher than those in maternal blood, indicating that transfer may be by active transport. The mechanisms are uninvestigated, however. Most cations and anions are transported with relative ease. The fetal concentrations of total Ca2+ are higher than the maternal plasma concentrations, and there is a net flux of Ca2+ across the placenta, as evidenced by fetal uptake. Calcium occurs in plasma in the protein-bound form and the free ionized form. If we assume that Ca2- crosses the placenta only in the free ionized form, either there is a sufficiently large electrical potential difference across the exchange membrane to account for the higher fetal than maternal concentrations or there is active transport of Ca2+ across the placenta. The concentrations of phosphates are also much higher in fetal than in maternal plasma. As with Ca2+ , there must be either a transplacental potential difference or active transport to explain this difference. Iron is transferred preferentially to the fetus by active transport and achieves a higher concentration there than in the mother. In maternal plasma, iron is bound to a protein, transferrin, that binds to receptors on the trophoblast. The iron is then removed, leaving an empty molecule (apotransferrin) that returns to the maternal circulation to acquire more iron. The unbound iron then is actively transported to the fetal side, where it is taken up by fetal transferrin. There does not seem to be a retrograde transfer of iron from the fetus to the mother. Copper crosses the placenta with relative ease; zinc apparently is transferred much more slowly. The mechanisms of transfer are unknown. Despite their large molecular size, maternal plasma proteins also appear in the plasma of the fetus. The mechanisms by which passive immunity is conferred to the developing fetus are the most thoroughly studied aspects of placental protein transfer. Differences in transfer rates among proteins cannot be explained by molecular size, because γ-globulins, specifically γG and γA, are more than twice the size of albumin but are transferred to the fetus at a rate faster than that of albumin. Several hypotheses have been proposed to explain the mode of selection and transport of immunoglobulins, but all involve a combination of binding of immunoglobulins to specific receptors in the placental membrane and pinocytosis, a process somewhat analogous to phagocytosis by macrophages. Pinocytosis is an active cell process, like active transport, it requires the input of energy. Although these processes have been studied most extensively in the yolk sac placenta of rabbits, guinea pigs, and rats, the same events apparently occur in the chorioallantoic placenta. Immunoglobin receptors have been demonstrated on human placental membranes, although they have not been chemically characterized. Albumin, glycoprotein, and mucoprotein cross the placental barrier quite slowly and in proportion to their molecular weights. Thyroxine and triiodothyronine both cross in small amounts, although enough may be present to depress the fetal thyroid. The placental transfer of glucagon, growth hormone, insulin, follicle-stimulating hormone (FSH), luteinizing hormone (LH), and prolactin is too slow to be of physiologic significance. In addition to CO2, the fetal wastes (i.e. urea, bilirubin, and small amounts of creatinine), must be eliminated. Urea apparently crosses to the maternal circulation by simple diffusion. Bilirubin exists in two forms: the unconjugated form, which is carried in the plasma bound to plasma albumin, and the conjugated form, which is water soluble and carried in the plasma as such. The unconjugated form dissociates from albumin easily and diffuses rapidly from fetus to mother across the placenta. Conversely, the conjugated form is so lipid insoluble that it is restricted to the interstitial spaces of the placental barrier; therefore, it diffuses across only slowly. The placental transfer of creatinine has not been investigated. Intact fetal red blood cells are found in the maternal bloodstream, apparently transfused through small disruptions in villi into the intervillous space. As much as 0.5 ml of fetal cells may be found in the maternal bloodstream. Fetal and maternal platelets and leukocytes interchange freely, but there is no documentation of maternal red cells in the fetal bloodstream. At one time the placenta was thought to function almost exclusively as a transport organ; however, it is known now to possess many other functions, not the least of which is the production of hormones.25,26 From the earliest days of pregnancy, trophoblastic cells produce a variety of hormones; in fact, both gonadotropin and steroid synthesis have been demonstrated in rabbit preimplantation blastocysts. The protein hormones made by the placenta are remarkably similar to their pituitary counterparts. The two most important protein hormones produced by the placenta are human chorionic gonadotropin (hCG), and human placental lactogen (hPL). hCG is a glycoprotein in which the carbohydrate portion represents approximately 30% of the molecule. Like other glycoprotein hormones (i.e. FSH, LH, and thyroid-stimulating hormone [TSH]), hCG consists of two noncovalently bonded subunits, α and β, with molecular weights of 18,000 and 28,000, respectively. The α subunit is nearly identical to the α subunits of other glycoproteins. The β subunit is specific to hCG and has a 30-amino acid residue at the carboxyl end that is not present in β subunits of the other glycoprotein hormones. The preparation of antibodies to the α subunit is the basis of the radioimmunoassay specific for hCG, which is useful in the diagnosis of pregnancy. Several facts support placental origin of this hormone. The highest concentration of hCG is found in the placenta, and removal of all chorionic tissue eliminates hCG from maternal plasma. hCG is produced in molar pregnancies in the absence of a fetus, i.e. incomplete mole. The site of hCG production is more difficult to evaluate. Classic studies indicate that hCG is produced by the cytotrophoblast and that the decline in levels at midpregnancy coincides with the disappearance of cytotrophoblast cells, as shown on light microscopy. Electron microscopic studies indicate that the cytotrophoblast does not disappear but is attenuated or thinned during the last half of pregnancy. There is well-developed endoplasmic reticulum in the syncytiotrophoblastic cells, indicating an ability to synthesize proteins. Immunologic studies have demonstrated the presence of hCG in the syncytiotrophoblast of both early and full-term placentas, but this does not prove that it is produced there. The regulation of hCG synthesis is the subject of intense investigation. It has been observed that cyclic adenosine monophosphate stimulates its production by trophoblastic cells in culture. hCG can be detected in serum as early as 10 days after conception. There is a marked rise 10 to 14 days later, with a peak at 45 to 60 days after conception (Fig. 11). Serum levels then drop abruptly to low levels, which persist to term. Urine hCG levels closely parallel serum levels. Urinary excretion of hCG is the basis for all of the current qualitative tests for pregnancy. Modern immunoassay techniques make it possible to detect hCG as early as 7 days after conception, when it is indistinguishable from LH. If ovulation is late during the study cycle, this lack of specificity can be confusing. The function of hCG is confusing. Corpus luteum function definitely is prolonged by the action of hCG. However, many studies have shown that bilateral oophorectomy may be performed in the first few weeks of pregnancy with no ill effects. hCG concentrations reach a peak at a time when the hormone no longer is needed. hCG stimulates placental estrogen production, but there is no evidence that it is necessary for it. Small amounts of hCG reach the fetus and may play a role in the early development of steroid synthesis in the fetal adrenal and testes. It has been found that hCG inhibits the in vitro lymphocyte-stimulating effect of phytohemagglutinin. This has been interpreted by some as indicating a partial suppression of immunity and as affording a means by which the fetus, which is immunologically foreign because of inherited paternal antigens, avoids rejection as a foreign body. However, there is little other supportive evidence for these speculations. hPL is a single polypeptide chain with a molecular weight of approximately 20,000. It is similar to human growth hormone; about 80% of the amino acid residues are identical in the two molecules. The term human placental lactogen, like the term human chorionic gonadotropin, applies to biologic activity rather than to the hormone itself. hPL is produced by the trophoblast. It disappears from maternal serum within a few hours after delivery of the placenta. Immunofluorescence studies localize hPL in the syncytiotrophoblast; polysomes and messenger RNA isolated from the syncytiotrophoblast tissue and incubated in vitro have synthesized hPL. The regulation of hPL synthesis also remains an enigma. In general, the amount of hPL formed is related to placental size, but other factors, such as ionic environment and nutrient variables, may also contribute. It is of interest that rapid intravenous infusion of glucose decreases hPL, whereas intravenous arginine raises plasma hPL levels. hPL secretion may be regulated to some extent by some placental factor analogous to the hypothalamic factor controlling growth hormone release by the pituitary. hPL has lactogenic activity in animals and puerperal humans and luteotrophic action in the rat. There has been some evidence that it has growth hormone-like activity; it may potentiate the ability of growth hormone to cause growth of the tibial epiphyses in hypophysectomized rats. Evidence of its growth hormone-like activity is limited, however, and is subject to question. hPL has also been shown to suppress the in vitro phytohemagglutinin-induced lymphocyte response, but the significance of this phenomenon is not clear. Small amounts of hPL do appear to reach the fetus, although the role of this hormone, if any, in fetal development is unknown. hPL has been used as an index of placental and therefore fetal well-being, because concentrations in plasma rise as term approaches (Fig. 12). Other protein hormones have been reported to be produced in the placenta: human chorionic thyrotropin (hCT), human chorionic follicle-stimulating hormone (hCFSH), and human chorionic corticotropin (hCC). Like hCG and hPL, they are named for their biologic activity and are similar to their counterparts produced in the pituitary. Their functions in pregnancy are unknown. During pregnancy, there is a gradual increase in the urinary excretion of progestins and estrogens. This change in steroid metabolism with gestation is secondary to the biosynthesis of steroid hormones by the placenta and fetus. Three estrogens are produced by the placenta: estrone, 17β-estradiol, and estriol (Fig. 13). The primary evidence for their production by the placenta is the fact that placental fragments incubated in vitro synthesize estrogens from neutral C-19 steroids. The fetus and placenta must be present for the production of the large amounts of maternal estrogen normally found in serum and urine during pregnancy; thus, the term fetoplacental unit was coined. The placenta aromatizes the androgens dehydroepiandrosterone, androstenedione, and testosterone, produced by the fetus, to estrogens. This process takes place in the placental microsomes and is catalyzed by cytochrome P-450. The synthesis of estrogen is known to be stimulated by hCG and hPL, and the placenta may regulate its own estrogen synthesis. Fig. 13. Structures of estrone, 17β-estradiol, and estriol. The function of the elevated estrogen level during pregnancy is unknown, except that it seems to stimulate growth of the uterus, particularly the myometrium and its vascular supply, as well as the breasts. However, the elevated levels of estrogen, which rise progressively to term, form the basis for the best clinical test available for assessing fetoplacental well-being. Most of the estrogens formed are excreted in the urine bound to glucuronate or sulfate. Excreted estrogens are estriol, 80%; estrone, 15%; and estradiol, 5%. In the biosynthesis of estriol, one of the steps, 16α-hydroxylation, takes place only in the fetal adrenal gland. Therefore, absence of the fetal adrenal gland (as in anencephaly) or chronic maternal illness causing fetoplacental deprivation lowers the amount of estriol, and thus total estrogen, excreted in maternal urine. Maternal 24-hour urinary estriol excretion is a valuable screening test for fetal well-being in patients with diabetes mellitus, chronic renal disease, and hypertension (Fig. 14). It is also helpful in estimating fetal maturity. Progesterone is also synthesized in large amounts by the placenta, using maternal blood cholesterol as the principal substrate, whereas the fetus contributes very little to the total progesterone production. Progesterone and its metabolites (Fig. 15) are found in maternal serum and urine as long as the placenta is in situ and functioning. Near term, the human placenta produces about 250 mg of progesterone daily, of which about 75 mg are delivered to the fetus for adrenal biosynthesis of steroid hormones. The mechanism regulating progesterone synthesis is unknown. Pregnanediol is the primary urinary excretion product; however, it is unreliable as proof of progesterone level, because it can also be derived from other sources such as deoxycorticosterone. Fig. 15. Structures of progesterone and pregnanediol.